Louise Olsson is a Professor at the division of Chemical Engineering, where she also is the manager for the Chemical engineering division. 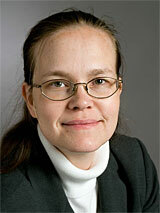 Further, she and her group are also associated with Competence Centre for Catalysis (KCK). In Louise’s research group they work with catalysis for emission cleaning and alternative fuel production. More specifically, the aim is to combine experiments and kinetic modelling for increasing the fundamental understanding of the reactions occurring on the catalytic surfaces and also to be able to predict the conversion after the catalyst. Further, in Louise group basic science projects, are combined with applied projects together with industry. There might be more projects where Louise Olsson participates, but you have to be logged in as a Chalmers employee to see them.